Waterford SPCA got a call recently about a seal pup found in a distressed state on Annestown Beach. When our officers arrived at the beach they found a very emaciated young seal, lying on the beach entangled in a fishing net, without a chance of escape. The young seal was very thin, he probably couldn’t swim fast enough to catch fish due to the drag from the net. It is estimated that he had lost between fifty and seventy per cent of his normal healthy body weight. The folds of skin on his sides that you can see on the picture are not ribs but spare skin where he has lost the layer of blubber he needs to survive in cold water. 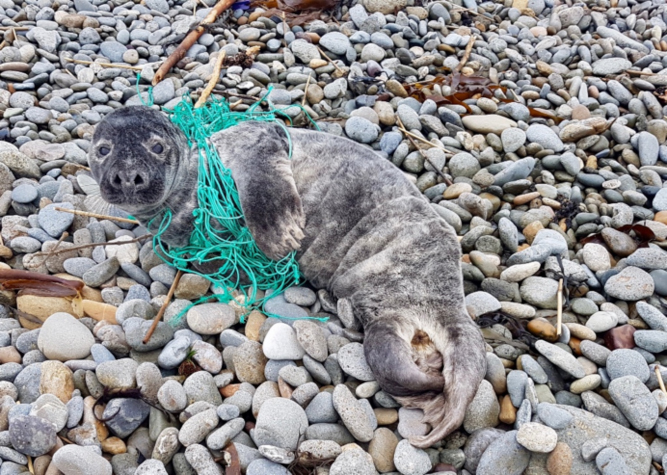 Once the netting was cut off, the seal was removed from the beach by Waterford SPCA employee Tony Penkert and taken to Seal Rescue Ireland. Thankfully little “Toothless” made a fantastic recovery – thank-you Seal Rescue Ireland. See the video below of him being released back to sea at Bunmahon. Good luck “Toothless” – we wish you a long and happy life!!! !